Commissioner Fuller joined the NSW Police Force in 1987. He performed general duties and criminal investigation duties in various metropolitan stations and specialist investigative areas. In 2002 Commissioner Fuller was promoted to the rank of Inspector and performed the roles of Duty Officer, Crime Manager and TAG Commander. Subsequently he was promoted to Superintendent in 2004 and worked in a numberof positions including as Local Area Commander in the City Central LAC. He was also involved in the planning and operations of APEC in 2007 and World Youth Day in 2008. He gained experience in the Police Executive Offices as Staff Officer to the Deputy Commissioner Field Operations in 2007 and 2008. In 2010 Commissioner Fuller was appointed to the position of Assistant Commissioner, Region Commander, SouthernRegion. He was subsequently appointed to the positions of Assistant Commissioner, Commander, Professional Standards Command and then to the position of Assistant Commissioner, Commander, Central Metropolitan Region. Commissioner Fuller was also the Corporate Spokesperson for Family and Domestic Violence. He also has experience acting in the positions of Deputy Commissioners Field Operations and Corporate Services. 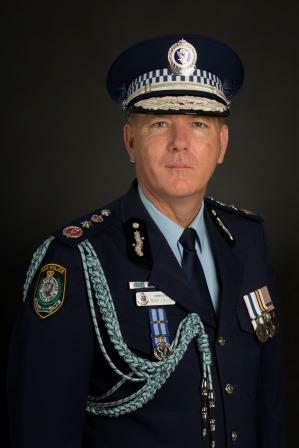 Commissioner Fuller received the Australian Police Medal in 2009. He holds a Graduate Diploma of Executive Leadership, and Diploma of Applied Policing and a number of diplomas and certificates in leadership and management. Commissioner Fuller is married with 4 children.